Thank you Green Planet Yarn! 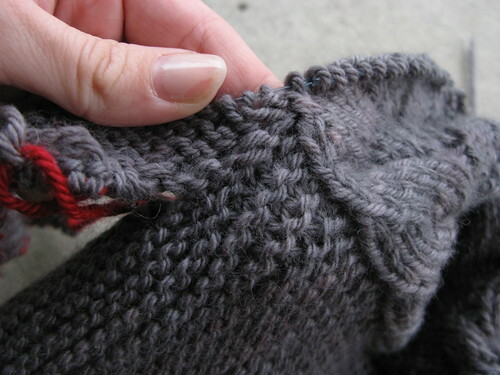 First of all you have to listen to this knitting song from NeverNotKnitting, this great blog/podcast I just discovered, with wonderful pictures and lovely patterns. I made the show & tell group at Green Planet Yarn in Campbell listen to it and we were rolling with laughter as one of the knitter’s husbands was completely identifying with the song 🙂 The event was very fun, it is inspiring to see what everyone is making! To top it off you get a raffle ticket for each item that was made from yarn from their shop and there are door prizes! 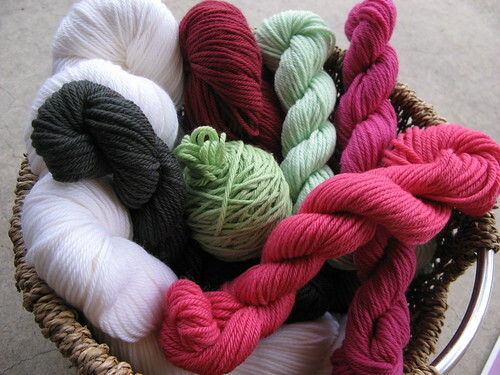 I won the yarn pictured above!! 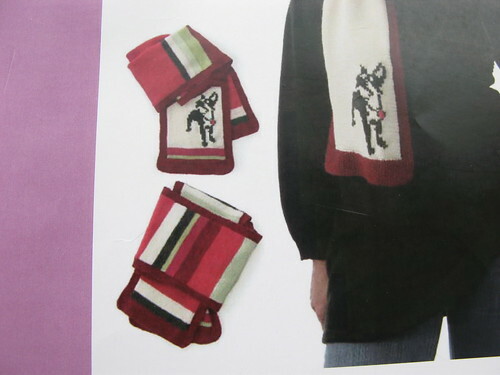 It’s a scarf kit from ravelry with their little boston terrier mascot on it. 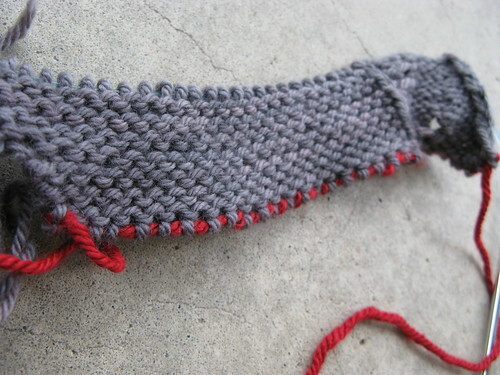 I won’t be making the scarf, although it is very cute. 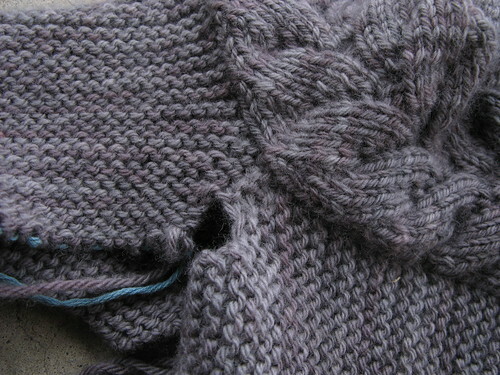 I’ll probably end up making a little baby girl cardi out of it with all those variations of pinks and greens and white. If you are local to Campbell, CA you should definitely go to the next one, it’s planned for May 8th at 3:30pm. 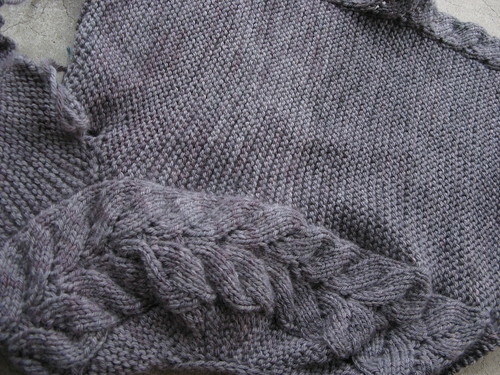 I completed the back, and started the left sleeve on the vine yoke cardigan! I’m trying to get done in time for stitches west this Sunday 🙂 I’m still very worried about how it will turn out because it looks so so tiny, but blocking is magical, so we’ll see! I’m getting a lot of practice with wraps and turns (w&t). 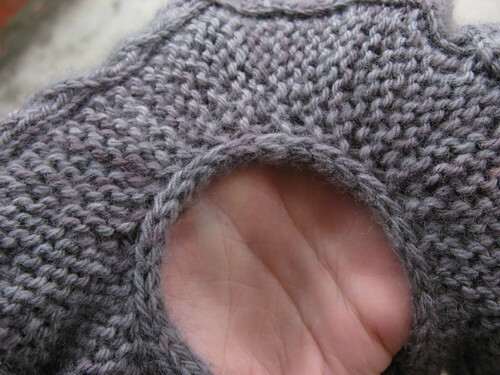 The pattern says that you don’t need to pick up the wrapped yarn and work it along with the stitch, but I found that it looks a lot better if you do pick up the wraps in the raglan shaping for the sleeves.